Bounce houses have come a long way in recent years. Gone are the days of standard inflatables with simple primary colors; nowadays, these bouncy party must-haves encompass favorite characters, jungle animals, and even dinosaurs. If you’re hosting a kid-friendly party in the Rochester, NY, area, Leap N’ Laugh is the go-to source for party rentals. Is your child fascinated by all things locomotive? If so, consider this inflatable a must-have for your next backyard bash. Your imaginative conductor-in-the-making can bounce alongside all of their friends in this unique twist on the traditional bounce house. This combo is 18’ tall, 33’ long and 13’ wide. It includes a large bouncing surface and a large slide that exits the front. 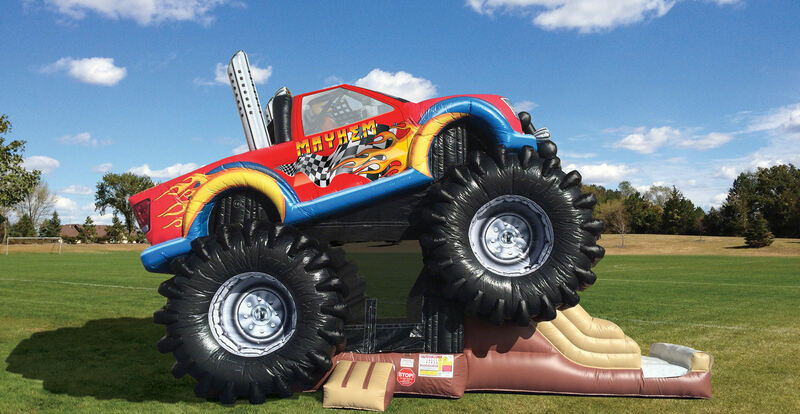 This truly is a must for your monster truck themed birthday parties. Any fans of firefighting Dalmatians and crime-stopping shepherds will appreciate this kid-friendly inflatable. Not only is this bounce house rental a great way to keep the kids busy all day long, but it also makes a perfect photo op for your littlest puppy lovers! For a truly show-stopping party experience, delight your guests with a massive dino-inspired slide and house combo. Up to six guests at a time can make their way into the bounce for some jumping, then slide away from the 18-foot T-rex topping the inflatable. Suited for your youngest guests, the Little Leaper is a scaled-down bouncer made specifically for little ones. It’s 9-feet tall, making it the perfect rental for smaller properties. With a slide and bounce area combo, it still boasts plenty of ways to keep children occupied for hours. Reserve your bounce house rental from Leap N’ Laugh today by calling (585) 469-8922. You can also stop by their indoor facility to see some of their jaw-dropping party rentals in action. Don’t forget to check out their website for more options and like them on Facebook for updates.